In season 3 of Bar Rescue, Jon Taffer and crew went to Pawcatuck, Connecticut to makeover the Handlebar Cafe. 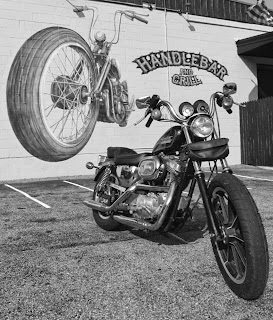 The Handlebar Cafe is a biker bar run by two sisters whose partying ways are impacting their business. Despite being near multiple motorcycle dealerships, the bar was still struggling and needed the help of the Bar Rescue crew. 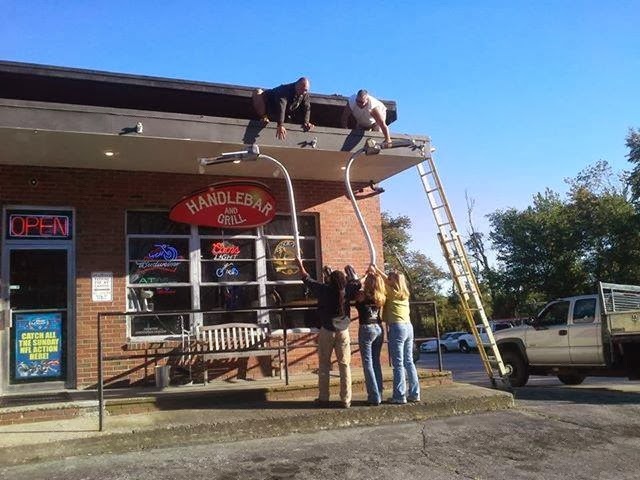 Bar Rescue decided to change the name to Handlebar and Grill during the makeover, but the owners have decided to keep their old name. "I came here on the way to Rhode Island with a friend because we wanted to see a bar that was featured on the show Bar Rescue. We were expecting it to be a rough place since it's a biker bar. It ended up being a bar for a slightly older crowd which wasn't necessarily a bad thing...The owner was clearly drunk at around 8PM when we spoke with her but she was very nice. All in all, it's a great place to check out if you're a bar rescue fan....Check it out if you're in the area." "This bar should serve only beer because the bartenders can not mix a simple cocktail." Update from the end of the show: Six weeks after the show, drink sales were up 25%, and according to Betsy, the kitchen has been great. Recently the town of Stonington issued a notice of violation to the Handlebar Cafe for failure to obtain the proper permits. The issues were the new mural on the side of the building (as they consider it a sign, which needs a permit) and the handlebars mounted on the roof (safety concern). Since permits weren't obtained and the problem wasn't rectified, the town filed a lawsuit against the Handlebar Cafe and they faced a $100 per day fine. According to the Handlebar Cafe Facebook page, they have decided to take down the handlebars above the front door rather than fight a lawsuit. The picture to the right is of them taking down the handlebars. It looks like Betsy is still having a good time at the bar, and in many of the articles regarding the lawsuit, she stated that business was strong and that people were coming from all over to see their bar because it was on Bar Rescue. Bar Rescue didn't obtain the proper permits as they wanted to keep the renovations a surprise, and the town was OK with it at the time. Hopefully there does not continue to be issues between the bar and the town, and all open issues can be resolved quickly. Typical government overreaching. Instead of working with the bar to help a tax paying business rectify the situation, the decide to go to war with them. All the elects government officials that support these heavy handed tactics should be recalled and replaced with real public servants. Just like politicians to reach into the pockets of small business owners and grab as much money as they can when a business gets a break like BR. Typical greedy fckutards. The city could've worked with the bar but NOOOOO00000oooo.... Maybe Betsy should take what she learned along with all the gear and open up in another town. Loser, city. In fact, this is typical with most BRs and why most change the name back. BR SHOULD apply for the proper permits but that would screw with the 7 day filming schedule. These greedy little towns should be grateful that a major reality show would pump a bunch of money locally/temporarily AND, in the long run, gain much more tax revenue from a successful episode. People are coming into this little sihthole town from all over the planet ... why? Because they saw it on TV. Otherwise they would never have gone out of their way to go to some toilet they've never heard of. The sad truth is that this is the producers MO. They know months ahead where they are going and have plenty of time to pull permits, they just don't care if these business owners are fined or not. It isn't their first walk in the park. Wow really. That town just wants money. So when you paint your house you don't need a permit? Sounds like a HOA in that town they enforce it on businesses then theyll be telling you what color it will be. Typical short sighted power hungry local government. They would rather have a business go under than find a way to bend some zone rules. I have a feeling that if the bar sued Bar Rescue they would win. The handlebars on the roof, I can kinda see the point. I know one of the cities where I live has ordinances regarding above the building signs, but considering the mural a "sign" is a bit ridiculous. Besides, without that mural on the side, the visibility of the business is rather reduced. Whatever. In the balance, the Handlebar Cafe is better off with the Taffer treatment plus any fines plus mural over-painting plus handlebar removal. The alternative would have been no Jon Taffer and having the entire place financially go under. Please start taking a bit of time to think before you comment. Cost/benefit analysis isn't always black and white; every fool knows that. Based on your litany of ignorant comments, I wish someone would buy you a calculator. If you had one, you would be able to do the math and see that failing bar owners are better off getting things done quickly then dealing with permitting and ordinance issues afterwards. The alternative is no show, no Jon Taffer, no advice, and no renovations, which means almost certain business closure. Are you too thick to see what's going on? THEY CAN'T DO THE SHOW IF THEY HAVE TO WAIT MONTHS TO GET PERMITS! "It's their job as the "contractors" to come in and know that murals need a permit, handlebars would be a safety concern, etc." Really. And since when is Eyeworks USA (the television production company) a licensed contractor? How about NEVER. Once again, it's worth it for failing bar owners to deal with these hassles; after all, they received a lot of valuable goods and services for free. But if you REALLY want to sue someone, you need to go after the contractors who did the permit-defective job. If the guys holding the camera's were doing the work then yeah, Eyeworks USA would need licenses. Since all the hired workers are licensed contractors what the hell are ya talking about. 1) How does any business function properly when those working there are so dysfunctional? 2) There was a reference made to pouring alcohol out of 1/2 gallons versus 1/5 gallons and Jon dismissed it at being an insignificant savings? Here in PA there is a significant difference! Using the gold standard of Smirnoff Vodka - 750 ml costs $ 14.49 ($0.571 / ounce) and in 1.75 costs $ 23.99 ($0.405 / ounce) that's a savings of $0.166 / ounce!!! 3) Show follow-ups are depicting a situation regarding permitting and fines. 4) How in the world do you have a "kitchen" and not use it? 1) It seems to me that the "hidden cameras" are not so "hidden"? If I worked in a place daily, I'm pretty sure they'd be noticed? 2) The production staff does a great deal of lead work and planning prior to Jon just showing up. 3) If you read these threads the permitting issues are starting to become a serious issue! 4) Apparently the show has "sponsors", how many of these sponsor obligations affect Jon's recommendations? Jon claimed in an interview to spend an average of $ 250 K, however, that may well be in perceived value versus real prices. 5) I think that Jon is a very savvy guy and I wish he'd stick more to bar science and demographics versus drama. All in all, all of these "reality" series center around an "expert" that is paid to help those that are less experienced or less knowledgeable. Always bear in mind that these "experts" are there for a paycheck and ratings! For those of you whining about the local governments being money hungry, you don't know what you're talking about. Also lots of information is omitted from this page that was reported on the local news. First of all half of Mystic, Connecticut is located in the town of Stonington. Mystic isn't a town in its own right but it is village that is split between two towns - Groton and Stonington. Mystic is a tourist destination. Some of the Stonington part of Mystic are on the National Register of Historic Places as a historic district which means it is historically or architecturally significant. Regulating construction and signage is important to keep the historic parts of town historic. It was brought up at the Planning and Zoning Commission meeting that they didn't want to create a double standard since all other businesses need to apply for permits, they can't make an exception. she was issued a cease and desist order but had 15 days to appeal it. She didn't bother to appeal it. It wasn't until September that the town of Stonington filed suit to remove the unauthorized signage. She has to go through court to decide if there was a willful violation of zoning regulations. So she had ample time and notice but was too lazy to just fill out an application with the town. The town did give ample warnings and notices. She had over four months to apply for permits but didn't. She even met with the Town Planner but still didn't apply for permits. If she removed the name of the bar from the mural it wouldn't be considered a sign. They aren't reaching into the pockets of small businesses, they are trying not to create a double standard. The owner just needed to fill out a piece of paper and submit it to the town and was just too lazy to do so. It could have all been avoided. Check the local news reports of this, there is a lot omitted here about the owner's laziness in this situation. Part of the town of Stonington (Mystic) is located in a historic district listed on the National Register of Historic Places and summer tourist spot. Regulating signage is important to keep the historic parts of town looking historic. The Handlebar Cafe isn't located in Mystic but the rules apply to the whole town. It was brought up at the Planning and Zoning Commission meeting that they didn't want to create a double standard since all other businesses need to apply for permits, they can't make an exception. She was given notice and opportunity to apply for a permit but simply didn't feel like it. So she had ample time and notice by the town but was just too lazy to just fill out an application with the town. She ignored the town for over 4 months and she decided rules didn't apply to her. If she just simply went to town hall and filled out paperwork all this would have been avoided. Plus Mystic is prime commercial real estate anyways and there is no shortage of small businesses who pay lots of taxes there. Naw, "guest", politicians aren't money grabbing dirtbags.... Who doesn't know what they're talking about? Contractors have to pull permits. If they don't they aren't any contractors that I'd hire. That's what I would be paying them for: To do the ENTIRE job from start to finish. i got pregnant in this bar. it was a blast! Is that supposed to make me want to go there? Funny answer, I love t! It's snotty New England. Need I say more.